We all have times in our lives when we need to make a decision about changing the course of our life. This past week, I made a decision to leave something I have been doing for the past ten years and leaving myself open to new possibilities. It has been a something I had been thinking about for quite a long time. I was hesitant, conflicted, and my inner thoughts muddled. 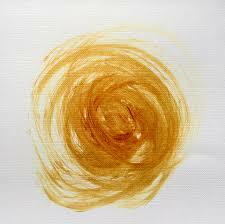 Years ago I was with a cohort of folks who used the work of Parker Palmer for personal and professional renewal. It was a multi-year program in which we came together for deepening our self-awareness and renewing energy to live and lead with authenticity, integrity and courage. While you hold it you cannot get lost. And you suffer and grow old. But you don’t ever let go of that thread. I forgot about just holding on to my own thread. It leads me. I just have to trust it and hold on to it. I have been taking a pause from a lot of things lately. I took a pause from this blog, my daily practice of drawing in my sketchbook and time spent painting in my studio. I sometimes felt guilty! Good grief, huh? 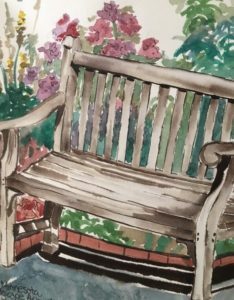 When I was sketching at the MN Landscape Arboretum I felt connected to a wood bench. I saw it as my metaphor for my pause. So I leave you today with sketch and this poem by Rachael O’Meara about “Pause.” I hope that it reminds you for taking time “off”, whether a few minutes on a park bench or in some other way. Create space to slow down and be present. Drowned out by clamor of life. The ability to do nothing and not want to do anything is powerful.